No Snow Or Freezing temperatures Here, Just Smiles!!!! I have been reading and seeing on TV the horrendous chaos caused both in the States and across Europe recently by the snow storms and freezing temperatures. Well over here in Thailand the nearest we got to snow was a few fake snow drops on the Christmas trees in all the shopping centres! Currently the weather in Thailand is very pleasant at around the mid 20’s centigrade with some cool breezes. It’s the perfect golfing weather. Sorry, I am not trying to make you jealous, but at this time of year, the birds are singing, the caddies are smiling, the courses are in tip top condition and the only reason for taking the golf umbrella is to get some shade from the sun. Ok so you are jealous…well after the snow has eventually melted, your local green keepers will be working overtime, as I expect your local course will probably need some serious maintenance. No golf today! So if I was you, I would pack the clubs and the sun block and grab a plane….I hear they are all flying again, so why not head over here and join us? Playing golf in Thailand is very easy. The only problem is which out of the 250 course you pick. Living in Thailand, I am actually spoilt for choice with over 60 Bangkok golf courses and another 20 or so Pattaya golf courses to choose from. Normally I try to pick a course that is within an hour’s drive along the expressways from the centre of town. 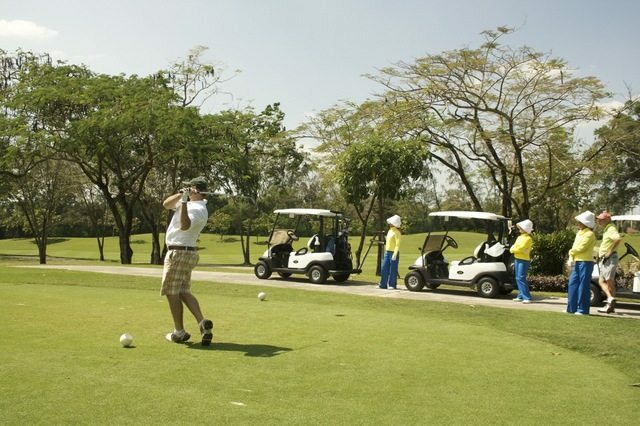 Some golf clubs like Lam Luk Ka or Burapha have 36 holes and encourage play on the front nine of one course and the back nine of another course, so you may be lucky to get two types of styles in one round. I normally take a local minivan which has room for friends & golf bags and it means we can all have a few drinks before, during the game and afterwards as well. So all you need is your sun block, your golf clubs, a reliable caddie and you could be heading for that winning scorecard.